If the Annual meeting of the Western was a person, it would now be eligible for Medicare. For our 65th annual meeting, we sojourn to the Phoenix area we last visited in late September 1991 when the ambient temp was about 100. This meeting will occur on November 8-11 when the valley of the sun is more amenable to being poolside (and school hasn’t just started). 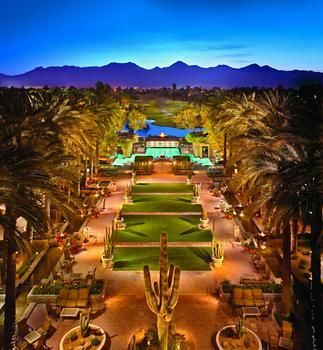 The locale is the Hyatt Regency at Gainey Ranch in Scottsdale. It is a 4.5-star resort with 10 swimming pools, waterslide, spa and the usual golf and tennis onsite. Our room rate is $285/night plus 14% taxes. Our intrepid Site Selection Committee has arranged for the usual resort fee of $29 to been waived and self parking is free (valet is $21/day). Each room has free wi-fi and maid gratuity is at your discretion ($4 recommended). A link to online room reservations for our meeting will be posted in January. The resort is 20 miles from Phoenix Sky Harbor airport. For shuttle service, the Hyatt recommends Transtyle (www.transtyle.com) who charges $50 for up to 4 persons and $70 for 5-6. The venue also likes kids/parents and offers 9-5 Camp Hyatt every day to entertain and feed them at $15/hour and evening Camp 5-9 on Friday and Saturday—arrange with concierge 24 hours in advance. Meeting registration will commence near the summer solstice and the meeting fee will as usual cover three breakfasts and three dinners for the registrant and a guest. The local night venue a work in progress at this point. Save the dates for this meeting in a fun place to gather. Of course, what else is going on in early November? The coast appears clear!